Born in 1919 Young Bill, as he was always known in the village, was the son of William Wootton and grandson of Joseph Wootton, Builder, for whom the house now known as Wootton House was built as a wedding present by his father Isaac. After leaving Banbury Grammar School he began working life as a carpenter and joiner but soon began his lifelong interest in flying by joining the RAF Volunteer Reserve in 1937 at the age of 18. He began his training at Sywell Airfield near Northampton and made his first solo in DH Tiger Moth G ADGS on 27th July 1937. Bill was soon learning to fly one of these “state of the art” machines and made his first solo in this type of aeroplane in March 1938. By April 1939 Bill had joined 44 Squadron RAF at Waddington just south of Lincoln and was training on Avro Anson aircraft. 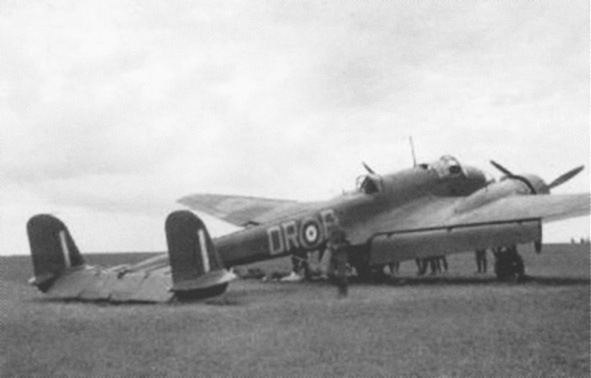 Ansons were used by the RAF as a coastal reconnaissance aircraft, but saw most service as a training aircraft. Early in 1939, 44 Squadron received its first Handley Page Hampden 1 Bombers and by June Bill was also training to fly these aircraft. After two months training with 76 Squadron at Finningley, in September 1939 Bill joined 61 Squadron at Hemswell in Lincolnshire. War with Germany had broken out on Sept 3rd and the squadron spent the winter in intensive day and night training exercises with reconnaissance flights over Germany taking place in March 1940. On the night of 11th/12th May 1940 Bill’s Hampden took part in the first big bombing raid on the German mainland. He took off from RAF Hemswell in Lincolnshire as one of a force of 36 bombers that attacked road junctions in the town of Mönchengladbach, the aim being to slow down the German army’s advance into the Low Countries which had begun the day before. There were further operations for Bill and crew on the 17th and 19th May. On 23rd May 50 Hampdens, 48 Wellingtons and 24 Whitleys took off to bomb communications and transport targets in Germany, Holland, Belgium and France. HP52 Hampden Mk.B.1 Serial number: L4146, QR-R was piloted by Flight Sergeant T.A. Ross with Sgt J.W. Wootton as second pilot. The remaining crew members were Sgt E.P. Corrigan and Cpl L. Walker. The aircraft ran out of fuel and forced landed on a patch of clear ground in the Black Forest between Horb and Rottweil, two small towns SW of Stuttgart, Germany. Horb, on the north bank of the River Neckar, being some 54 km SW. Initially the pilot thought they had come down in Scotland and it seems that a faulty gyro-compass brought about their unexpected arrival in captivity. None of the crew was injured but their relief at landing safely must have been somewhat tempered by hearing words in German rather than a re-assuring Scots burr! The crew were marched off into captivity and Bill’s whereabouts and movements for the next five years are meticulously recorded in his “Wartime Log” – a book provided to all prisoners by the YMCA via Geneva. Whilst Bill did not enlarge on his simple diary of events he managed to retain a series of fascinating photographs from the camps and an internet search has revealed an account written by a fellow RAF prisoner which exactly mirrored his own movements. This fellow prisoner was Frank Hargreaves of Preston who, sadly, died in 2005. However his family have kindly given me permission to include appropriate extracts from his memoirs to illustrate Bill’s experiences. Around the middle of May, all the non-commissioned ranks, approximately fifteen of us, were loaded on to a high sided wagon and taken to another camp in Limburg about thirty miles away north of Frankfurt. This was a filthy camp – the brick huts were louse-ridden and everybody quickly became infested. The toilet facilities were terrible: nothing but a deep trench with a tree trunk suspended on trestles on which we had to balance to do our usual routine jobs. The pit quickly filled up and the whole place stank. To wash, there was a standpipe with, sometimes, water available. It became a common sight to see a ring of prisoners sitting in the sand on which the camp was built, trouserless and running up and down the crutch seams with a lighted stub of candle popping off the lice. Fortunately the British sense of humour overcame the horror of the situation and even the most fastidious amongst us made jokes about it. the British (about six hundred in total though only twenty RAF) were marched down to a railway siding on which stood a long line of cattle trucks, about ten wagons. At the siding was a full contingent of German troops in full battle gear and with much shouting and wielding of rifle butts, we were all squeezed into the wagons, about sixty men in each. There was only a narrow opening, about two feet by six inches at the top of the wagon and as there was no room to sit or lie, we all had to stand. The sun shone down and heated the wagons like ovens and the guards slammed the doors, shooting an iron bar across. Very quickly it became unbearable and the odd lad began to pass out. We shouted and banged on the sides but to no avail. At long last with the usual clanking we slowly began to move and a little air came into the truck. Sometimes we crawled along and sometimes picked up a little speed, every now and then stopping in a siding to allow troop trains to pass. You can imagine the situation with around sixty bodies squeezed into a small space. With no toilet facilities, the floor of the truck quickly became awash with urine and even excreta. We got our meagre belongings together and one morning a detachment of Luftwaffe soldiers appeared. All the RAF POWs were assembled and counted before marching off down the road. We arrived at a small railway siding outside an even smaller railway station and were herded into cattle trucks, about thirty to a truck, which meant that we were able to spread ourselves out and it wasn’t too bad. It was a very slow journey and although we had been issued with a small portion of bread and leberwurst (a small roll of sausage) we all became very hungry, which was now almost a permanent state. The journey took thirty-six hours, although it should really only have taken about six but we seemed to spend our time being shunted into sidings whilst express or troop trains rattled past. I remember passing over the huge bridge that crossed the River Oder at Frankfurt-am-Oder, being called in time to look through the usual two feet by nine-inch gap, which gave us ventilation. We arrived at the small town of Barth on the Baltic and were escorted down the road for about three kilometres. What did we then see? Guard boxes on stilts and barbed wire fences! We had arrived at Stalag Luft 1, our first all RAF prison camp. There were three huts and across a sandy square, a kitchen block. We got ourselves sorted out in one of the huts and filled sacks from a huge pile of straw in the kitchen block to give us our mattresses. An English-speaking Obergefreite (Corporal) told us to collect rations at the kitchen in one hour. These consisted of a bowl or dixie of barley soup with scraps of horse meat in it and quite palatable, together with one loaf between ten men and a cup of ersatz coffee. That had to last us a day and the bread ration worked out at a slice of bread for each man, approximately half an inch thick. That was the lot! Red Cross parcels had never been heard of at this time and quite obviously after a week or two, malnutrition began to take its toll. You had to be careful getting out of bed otherwise you would collapse on the floor and being very light-headed, take a minute or so to get to your feet. All kinds of physical exercise were impossible and it took us all our time to struggle along. Shortly after this, the first Red Cross parcel arrived, the target set by the Red Cross being one parcel per prisoner per week. To my knowledge this was never attained although there is no doubt that had they not arrived, many more prisoners would have perished through malnutrition. Bill, third from left, receives a Red Cross food parcel. German guard on the right. Now that a few Red Cross parcels had arrived, it also gave us the opportunity to use the empty tins etc for the manufacture of cups, baking trays and so on. It is amazing how fairly sophisticated utensils could be manufactured from virtually nothing. Saws were manufactured from ordinary knives simply by tapping small grooves along the blade and then twisting them slightly. There were a thousand and one things to keep one occupied – that is if you were so inclined! It became all too easy for some prisoners to lie back and vegetate and that way lay eventual insanity. Also with the build-up of our emaciated bodies, minds began to turn to seeing how far we could hinder the Germans and more and more escape attempts were made, some admittedly stupid with very little chance of success. Roger Bushell and the X Committee then decided that all escape plans must be submitted to them for approval. Not everyone agreed with this because of a possible lack of security, but eventually everyone saw the sense of it. The ground at Barth, being so near the sea was sandy and although many tunnels were attempted, they didn’t succeed. There were also one or two what we called ‘wire jobs’, that is, over or through the wire and although one or two succeeded, the escapees were soon caught. Christmas came with the expected bout of misery, and everybody, especially the married men, dreadfully homesick. There was an almost complete silence in the camp with everybody immersed in his own thoughts. One or two hardy souls built snowmen and carols were sung. The International Red Cross had sent through one or two musical instruments and a piano! A musical evening was organised and again it was amazing to find the talent in the camp. We had an excellent pianist, more classical than jazz and also a Canadian who was first class on the guitar so that a rousing sing song developed. New Year came and with it the same sadness and homesickness. Once more carols were sung and most beautifully, from the German compound, male voices sang ‘Stille Nacht, Heilige Nacht’ which we knew as Silent Night. I think that caused more tears than anything else and at midnight through the loudspeakers scattered throughout the camp, the chimes of Big Ben followed by Vera Lynn singing, through the courtesy of some kind-hearted enemy in the German radio room. The loudspeakers were normally only used for propaganda purposes: almost daily ‘Sonder Meldungen’ (Special Announcements) broadcast the victories of the glorious German forces. No one took the slightest bit of notice, except to give a resounding raspberry! Sadly Bill’s fellow crew member Sergeant E.P Corrigan died from peritonitis in March 1941 and was buried in Berlin. In August 1941 Frank Hargreaves was moved to Stalag Luft 3 at Sagan in Poland and Bill followed in April 1942. The huts had rooms each side of a central corridor, with a small room at each end. The larger rooms held about fourteen or sixteen men. That worked out at about one hundred and twenty officers per hut. By now our ‘boffins’ had been hard at it trying to build a wireless set, and one very exciting day they succeeded with one officer attending each hut in turn and reading out the ‘One o’clock news’ from London. You can imagine the excitement, obviously suppressed; at least we now had some news from home and the morale of the camp increased still further. About this time the famous ‘wooden horse’ escape took place. We got quite used to the sight of four or five officers struggling out of the small concert room with the vaulting horse, setting it up and commencing to take turns in jumping over it. In retrospect, I think that if I had been a German, I would have become suspicious of the fact that it was always sited in the same place, but that was typical of the German mind – always ‘correct’ in the right place. Wing Commander Douglas Bader had now arrived in the camp, complete with tin legs and was a source of constant worry both to the Germans and indeed because of his ‘bloody’ attitude towards our guards, also to the rest of the camp, who naturally stood up for him in all his misdemeanours. He treated all Germans with complete disdain and did his utmost to be uncooperative. We were delighted to learn one day that the Americans had entered the war and it was obvious that, notwithstanding all their victories, the Germans viewed the news and the future with apprehension. Another Christmas passed by with no sign of an early release. When newcomers arrived in the camp and I told them that I had been a POW for two years they could not visualise how I had managed to survive and neither could I, although the initial homesickness had by now completely gone and I was in another world. Time passed slowly, enlightened by the occasional concert or play. Our theatrical company was very professional, the performers having been actors before the war or would become actors after it. An excellent camp newssheet was also put out although the authorities always vetted this. Bill’s carpentry and joinery skills were put to good use in constructing sets for these performances. Frank Hargreaves remained at Sagan until 1944 whereas in June 1943 Bill was moved to Heydekrug (Stalag Luft 6) in Lithuania where he spent the next year. Military authorities in Germany had realised early in 1944 that prisoner-of-war camps situated in occupied territory to the east and west would be safer inside the German borders. In July of that year Bill and other Air Force prisoners in Stalag Luft VI at Heydekrug, in Lithuania were evacuated to Thorn in Poland and after six weeks the were moved again to Fallingbostel in Hanover. Although conditions during transport were not always good, these were comparatively orderly moves in good weather by steamer and by train. Thereafter their living conditions showed a steady deterioration: Red Cross food almost petered out; the German rations were cut and the supply became more haphazard as Allied air activity increased; fuel was sufficient for perhaps three hours’ heating out of twenty-four. In March the Senior Medical Officer of a nearby camp wrote: “…. a marked deterioration of the general condition of the camp during the last three months, most marked since the supply of parcels was exhausted. All officers have lost a considerable amount of weight and are very pale and anemic. Although at the moment there is no serious increase in disease, at any moment we may get an epidemic and with officers in their present low state of resistance, the disease would spread throughout the camp. In early April there were cases of starvation and oedema and a great deal of bronchial trouble. Seven weeks on a bare minimum of 1300 calories a day had been sufficient to reduce everyone to an extremely poor physical condition”. The continual arrival of new batches of prisoners from the east in 1945 produced overcrowding, and as early as February new arrivals had to be accommodated in tents on the sports field. To make matters worse, all British prisoners at Fallingbostel had been from 14 January onwards deprived of their palliasses, all but two blankets, and a large proportion of their stools and tables, as a reprisal for alleged British ill-treatment of German prisoners in Egypt. A neutral inspector ascribed the prevalence of bronchitis and chilblains to lack of bedclothing, and after enumerating the reprisal measures, including the suppression of all recreation, described Fallingbostel as ‘a very bad camp’. Not surprisingly there are no more entries in Bill’s log during this period until May 2nd 1945 – the laconic words: “Liberated at Kittwitz”. This little place is near to Lubeck, about 100 miles north of Fallingbostel and it is likely that Bill and the other RAF personnel marched there as part of the many columns of German soldiers, prisoners and refugees fleeing before the advancing British, American and Russian forces, sleeping where they could at night, eating what they could scavenge and not infrequently harassed by the SS or even by “friendly fire” from allied aircraft. After a couple of days of sheer heaven, we assembled on the airfield and there stood row after row of Dakotas, waiting to fly us west. We climbed into the aircraft and took off for we knew not where, but we didn’t care because we were on our way home. ….the pilot flew over quite a few (English) towns and villages, all at low level to let us see the bombing damage done. I must admit that I had never visualised so much destruction – I wasn’t too happy. We landed at an airfield in England, but I hadn’t a clue where! We left the aircraft to be greeted and escorted by a crowd of WAAFs – I had never seen one before! After a light meal in a hangar festooned with Union Jacks, we were taken to the stores where at long last I was issued with a full RAF uniform again, together with two ‘Tate and Lyles’ (coat of arms) and medals. On donning them, I felt almost human again and I then found out that I was at Cosford. On May 11th 1945 Bill also arrived at Cosford and there his wartime diary ends. From the few conversations I had with him in the 1960s it was apparent that he had no lingering resentment for the Germans and indeed sometimes commented that in the final year elderly guards had shared with the prisoners the limited food available – all were simply waiting for the nightmare to end. However, his normal body weight of 12.5 stones had been halved by the time he arrived back in England. He was almost immediately in hospital, very ill with pneumonia, during which he was cared for by a WAAF nursing orderly Leading Aircraftswoman Margaret Swenson. Their friendship blossomed and they were married within six weeks of him leaving hospital, on15th September 1945, in Sulgrave Church. On leaving the RAF early in 1946 his release papers stated: “Attained Warrant Officer Rank with a fine record of service – was prisoner-of-war for five years – conduct and character in the highest category – a skilled craftsman at carpentry etc and in addition has a flair for organisation”. Back in Sulgrave he became a partner in the family building business, newly re-constituted under the name “Wootton Brothers”. He was, in fact, the nephew of the other two directors, taking the place of his father William who had been killed during the war when a Wellington bomber crashed on the building he was working on at Chipping Warden aerodrome. His last recorded flight took place in December 1952. He became a member of the 750 Motor Club and a very keen rally driver as well as frequently carrying out voluntary stewarding at nearby Silverstone Motor Racing Circuit. He was for many years a Special Constable with the Northamptonshire Force. Bill and Margaret had two daughters, Ann and Olivia, born in 1946 and 1947 and they well remember being part of the hectic lifestyle lived by their mum and dad, as illustrated below. Bill saw both of his daughters married in the village church…. Bill and Margaret left the village in 1976 and went to live in Milton Keynes where he took up a new position with a central heating company. He and Margaret visited daughter Olivia in Fort Lauderdale, Florida in 1971 and in 1977 visited her in Costa Rica, which was her home for 16 years. They made various other foreign travels but his real interest in what were to be his last few years was motor racing at Silverstone, Donnington and other circuits together with his continued involvement with the 750 club. However he had frequent respiratory problems following his prisoner-of-war experiences and this no doubt contributed to the pneumonia which caused his death at the early age of 62 in 1982. Margaret died in 2000. Daughters Ann and Olivia have recently re-established contact with the village after forty years and I am indebted to them for the loan of the photographs and logs which make up this web page. I am interested to know where the family of Bill Wootton got the photos taken in the Stalag camps with the printed numbers and captions. My husbands father also had a photo album bought home to NZ from WWII with the same photos which leads me to wonder if they were given out by the Germans to many POW’s. Any reply would be of interest.